Roasted kabocha squash soup, thick and creamy, with ginger, cumin, and coriander. 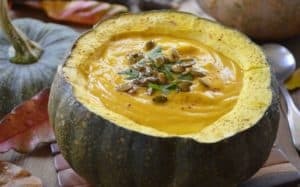 Perfect for fall and Turkey day!! Have you come across “Kabocha” squash in the market? It’s a Japanese variety of winter squash, one that is heavy and thick-fleshed, similar in that way to butternut squash, with a deep, rich flavor. Typically the outer skin is forest green, though some varieties are sunset orange and red as well. 1. Pierce top of squash with fork, so the steam will escape, and bake about 45 minutes or until tender. Scoop out contents, deseed and set aside. 2. Sauté onions, celery, garlic, ginger, cumin, coriander: Heat olive oil on medium high heat in a large (4 to 6 quart) thick-bottomed pan. Add the onions and celery. Lower the heat to medium and cook until softened, 8 to 10 minutes. 3. Add the squash to the pot with the onions and celery mixture. Add the stock, salt and pepper. Increase heat to high to bring the soup to a simmer, then lower the heat to low, partially cover and cook 8 to 10 minutes. 4. Purée with immersion blender to desired thickness. 5. Top with pumpkin seeds. ENJOY!